Welcome to Mr. Suave's Swingin' Cocktail Lounge. 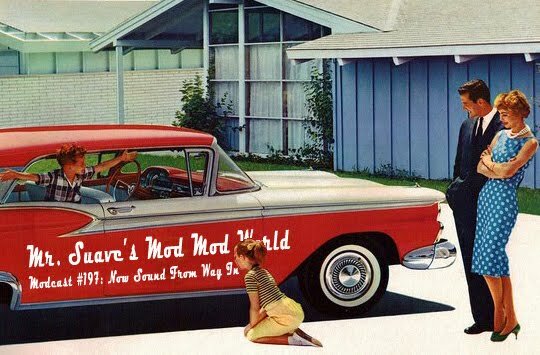 This week on the modcast it's the now sound from way in. That's right, seal your shaker I'm gonna mix up a cocktail concoction that will leave you jonesing for more more more: more loung sounds, more bachelor pad music, and most importantly, more martinis. The show is packed with iconic now sounds from the likes of Syd Dale, Joe Bucci, James Taylor Quartet, Piero Piccioni, Corduroy and more. For cool now sound lounge videos like the ones below, be sure to check out Uncle Jerry's Pad on Youtube. Since this is a Swingin' Cocktails edition of the modcast let me swing you a serious sipper. Here's a quick and easy classic. G&T. Gin and Tonic. Nothing says lounge cool quite like gin, and nothing is better for relaxing on a nice spring day than gin and tonic. G&T is perfect when you want brisk, tart, tangy gin goodness. Here's the secret. Don't make them one at a time, I mean what's the point, you've gonna want more than one anyhow right. Make a pitcher at a time. And use fresh ingredients. Start by juicing five or six limes. You're working on getting as much lime juice out of them as possible, and once you have it set it aside. Take the left over lime skins and cut them into slivers for in just a moment. Now pour one cup of gin into a pitcher, that's right one full cup. Next add those lime skins and mull them around to get the extra flavor out of them, you can mull them with a wooden spoon if you don't have a proper mulling tool. Let that sit for several minutes so that the gin gets good and infused with the limes. Now add your lime juice and four cups of tonic. If you want stronger and fewer G&Ts add less tonic, and if you want lighter and more G&Ts you can add more tonic. Whatever you like. Pour over ice into a highball glass. Now you're set to sit back, relax and turn on some cool now sounds and enjoy the fruits of your labor.